There has been a trend of late for new single malt expressions eschewing the traditional age statements. It has caused quite a stir in the whisky community with very good points to each side of the argument. I think it is fairly obvious that the main driver for the trend is the diminishing stocks of older whiskies. This current surge in whisky interest follows a depressing time for whisky distillers. Some people called it the whisky lake. During the 80’s and 90’s demand for whisky dropped significantly. People moved toward wine and other drinks. Distilleries were closing down. In fact Yamazaki didn’t produce any spirit in the year 2000. As a consequence, older whiskies are becoming harder to come by. Whisky companies are now relying on flavourful younger stocks to keep their brands alive. 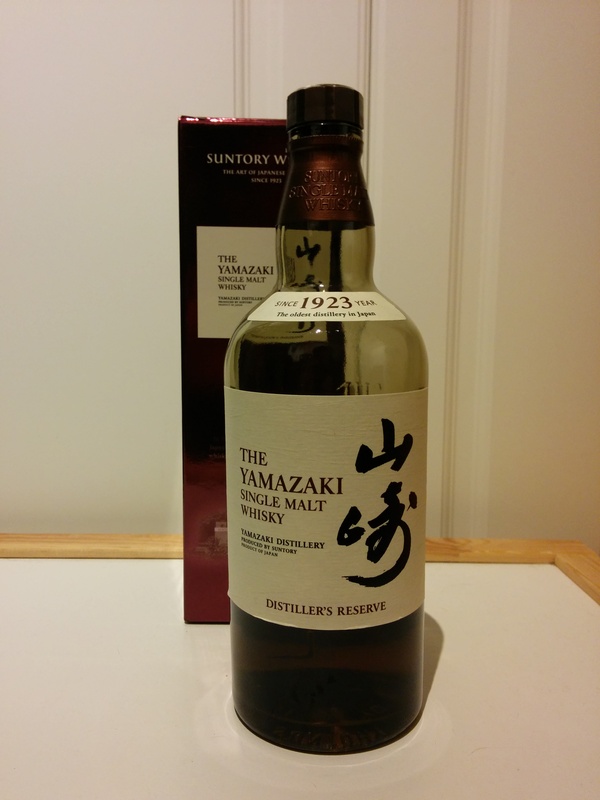 That’s the climate which has brought forth this newer release from Yamazaki. The Yamazaki Distiller’s Reserve was released about this time last year (late spring of 2014) in the UK. My first taste was at the 2014 Evening with the Blenders Event. I must say I was impressed back then and I am still impressed now. This supplants the Yamazaki 12 as the entry level whisky into the Yamazaki line up. Fresh fruits on a summer breeze. Grapes, melon. A bit of grass. Smelling it makes me think of standing in the middle of a field which a breeze blowing the scent of orchards across the grass. Very fresh and sweet. Rich sweetness that coats the tongue. An oaky spiciness kicks in mid-way through. Very syrupy to the point of overshadowing the fruits. Fruits come out later with the oak. The syrup at the beginning is almsot reminiscent of cough syrup. Just a touch. Spicy spicy Oak. I like. Surprisingly long finish. According to Yamazaki, quite bit of old stuff went into this whisky. There were hints that 20+ year old was used. I suspect that they went all out when creating this first batch to impress the non-believers and establish this as a quality whisky. I would say it would be better to stock up on this first batch now as it makes sense that they will begin running out of the “good stuff” to make this whisky.